Sapphire's Tri-X card is plenty fast, but not very efficient. Lots of memory; high performance; good price; reasonably quiet. Power hungry; weak factory overclock; requires a big case. Sometimes you have to admire the power cars of the world. Forget being environmentally friendly and efficient: we want all the power you can give us and we want it now! That’s apparently the thinking behind Sapphire’s latest graphics card, as it takes AMD’s new Radeon HD R9 390X—which is really just a rebranded version of the R9 290X but with 8GB GDDR5 memory—and gives you three fans to keep the power-hungry GPU cool. 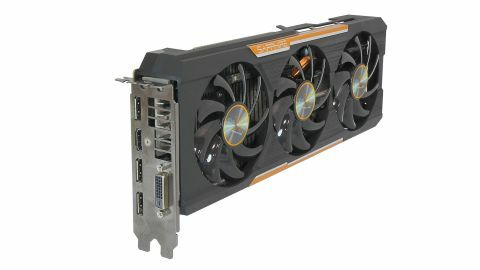 Sapphire is clearly intending users to overclock the card as well, as it includes two 8-pin PCIe power connections; combined with the x16 motherboard slot, the card has access to a staggering 375W of power. Without some form of exotic cooling, however, the GPU will top out long before it uses its full capacity. AMD’s suggested pricing on the new R9 390X is $429, and with the Tri-X cooling you’d expect to pay a slight premium, but that's not actually the case. The Tri-X 390X is listed at $429 on Newegg, which is Sapphire's recommended price. It's difficult to say where prices will actually settle this soon after launch, and we've already seen 290X 8GB cards for quite a bit less, including Sapphire's own Tri-X 290X 8GB. At least you’re not paying for the factory overclock, though Sapphire only bumped speeds by 5MHz over the standard 1050MHz clock. Why even bother at that point? The good news is we were able to goose things and managed a stable 10 percent (105MHz) core overclock. The memory is already running 20 percent faster than the 290X, so for most games there’s no need to push the GDDR5 any farther, but we were able to run stable at 1,600MHz. The results from the overclock are a consistent 5–10 percent improvement to performance, but power draw under load increases by more than 10 percent. This is our first chance to take the new R9 390X out for a spin, so we’re going to be pitting the Sapphire Tri-X against some of the other top-performing GPUs, including the new GTX 980 Ti along with the GTX 980, GTX 970, and R9 290X; we’ll even toss in an old GTX 770 for those wondering how the previous generation of hardware fares. AMD’s goal is clearly to take on the GTX 980, and with the increased clock speeds they’re able to go toe to toe with Nvidia. Who wins depends as much on the game of choice and settings as much as anything, with the Tri-X winning in several titles but trailing in others. The usual suspects favor AMD and Nvidia cards, with the notable exception of Batman: Arkham Origins. Previously an Nvidia-ruled title, the latest drivers and hardware from AMD give the 390X an edge over the 980. The 390X also holds onto a moderate lead in Hitman: Absolution, with a smaller lead in Shadow of Mordor. The GTX 980 wins the rest of the match-ups, with Unigine Heaven, The Witcher 3, and GTAV all favoring Nvidia by 10 percent or more, depending on the resolution. Of course, we’re running at standardized maxed out (or nearly so) settings, and it’s possible to tune each game to run substantially faster without sacrificing too much in the way of image quality—turning off HairWorks in The Witcher 3, for example, can provide a serious boost to frame rates. On average, however, Nvidia’s GTX 980 maintains a lead at 1080p and 1440p settings, but the 390X claims a victory at 4K, in part thanks to the 8GB memory, but mostly thanks to the 30 percent lead in Hitman; remove that game from the list and the 980 holds onto a small lead. The GTX 980 Ti wins in all the races, but at $220 more than the 390X it's understandably not in reach of many gamers. In terms of bang for the buck, the GTX 970 and R9 390 are the best values. The big problem here is that focusing purely on performance is missing the forest for the trees. Yes, AMD’s 18 month old design can still compete with Nvidia’s newer GTX 980, but even after overclocking, the GTX 980 is still going to use far less power than the stock R9 390X. And just to be clear, the GTX 980 can typically hit 15–20 percent overclocks, which puts it firmly ahead of the R9 390X. As for the Tri-X, Sapphire’s inclusion of two 8-pin connectors is probably more than is strictly necessary, and we only managed 120/100MHz overclocks. Even with only a moderate overclock, we had to boost the fan speeds to keep the card stable, which made the Tri-X pretty loud. It behaves a lot better at stock settings, where it’s much quieter than our old R9 290X blowers. In other words, while the sheer power of a muscle car can really sound impressive, when it gets beat regularly by a smaller car with better handling it loses some of its glamor. Toss in the fact that we know AMD’s Fury X is coming out next week, with promises of the standard Fury and the Fury Nano due later this summer. Even AMD knows R9 390X is a stop-gap solution, as they’re already bragging how the Fury Nano will deliver twice the performance per watt as the R9 290X. So if you haven’t already purchased an R9 290X, this is a tough sell, even with twice the memory. From a performance standpoint, at stock speeds, the 390X may be slightly better than the GTX 980 for 4K gaming, depending on the games you run, and it costs less as a bonus, but if you’re really serious about 4K gaming you should look at the GeForce GTX 980 Ti. Yes, it costs 40 percent more, but it also delivers 25 percent better performance, which is pretty impressive scaling at the top of the performance pile. And if you simply don’t want to play for team green, we still recommend waiting to see what the Fury X brings to the table. Meanwhile, those looking for better value continue to be best served by lesser GPUs; the GTX 970 and now the R9 390 deliver 80-90 percent of the 390X's performance for only $330.